We gather together in spiritual community because we need constant reminders of what matters most in life. In a world of heartbreak and dehumanization, our congregations and communities call on us to be our better selves. We learn to live with more wisdom, more connection, and more compassion. Our Sunday Services are weekly reflections that weave together our own thoughts and experiences with music, beauty, poetry, and words that both comfort and challenge. Our programs for all ages inspire us, and awaken us all to our capacities to make a difference in our own lives and in the world. Our children’s religious education programs help our littlest ones grow into thoughtful, compassionate, and caring individuals. 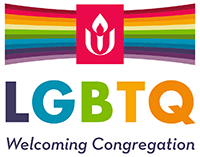 We are inspired not just by religious sources but by the people with whom we journey: thinkers, humanists, great people, and the diverse and spirited community of Unitarian Universalists.